These muffins are so moist, full of flavor and incredibly easy to make, even kids would love to make them, and not just eat them! In a large mixing bowl, mix the butter into the mashed bananas and add the cinnamon. Mix in the sugar, eggs and vanilla. In a separate bowl, mix the baking soda, baking power, salt and Xantham gum with the flour and add this to the wet mix. Add the tablespoon of chocolate syrup and combine. Finally throw in most of the chocolate chips and almonds and combine gently. 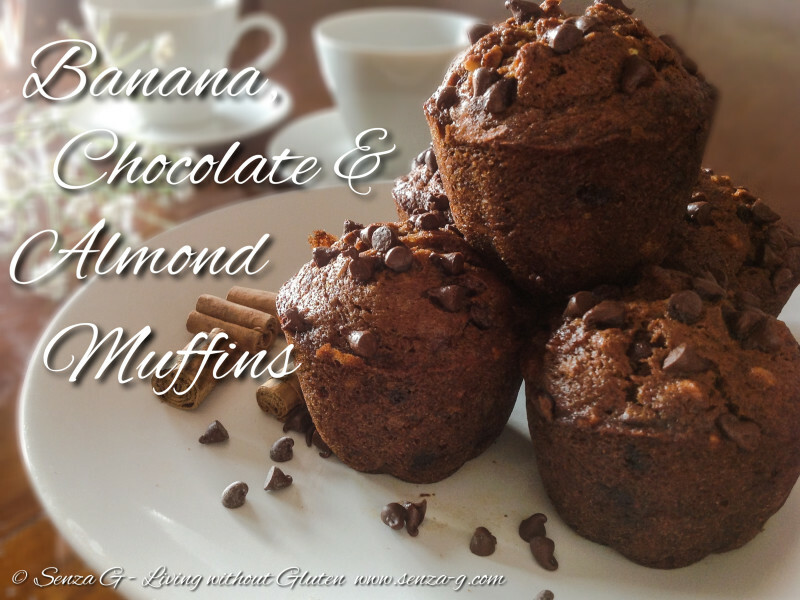 Leave some chocolate chips to put on top of the muffins before baking. Pour into a greased or paper cup lined muffin pan and bake until a skewer when inserted, comes out clean.